For years, when friends would ask what they should grab with their remaining end-of-the-month eMusic credits, my go-to ‘download recommendation’ was consistently “anything by Tinariwen.” I no longer use eMusic, but if Tinariwen’s music is still part of their catalog that recommendation stands. You’ll thank me later. This month sees the release of Tassili, the Tuareg musicians fifth LP since the release of 2001’s The Radio Tisdas Sessions — it also marks their first collection of music not released via the World Village Music label. In its stead (the increasingly eclectic) Los Angeles based Anti Records is set to release Tassili on the 30th. A gripping follow-up to Aman Iman: Water is Life (2007) and Imidiwan: Companions (2009), the LP is a continuation of Tinariwen’s rhythmic, and at times incredibly psychedelic, Saharan desert blues, only this time sans amplified sound. 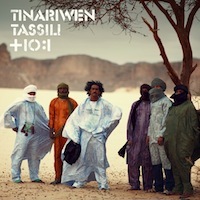 Per the production notes, Tinariwen “have set down their electric guitars and returned to the very essence of their art. Recorded in a protected region of the South-Eastern Algerian desert, the group returned to the roots of their music, with only acoustic guitars and unamplified percussion.” While several Western artists pop up throughout the length of the record (tastefully, thankfully) it is TV On The Radio’s Tunde Adebimpe and Kyp Malone’s soulful collaboration on “Tenere Taqqim Tossam” that is the standout. If new to Tinariwen’s music, in addition to getting to know the records, might I suggest this multi-part documentary on the group — a group whose music and circumstances are well worth exploring. Love these guys. Caught them during sunset at the Hollywood Bowl last year with Fool’s Gold, Baaba Maal and Yeasayer. They blew me away! I love Tinariwen! I played them for Brain as inspiration for The Valence Project sessions. Saw them at SF Jazz last year; even better live. I saw these guys rock at Coachella the same year TV on the Radio did (4/2009) – is that how they got connected?